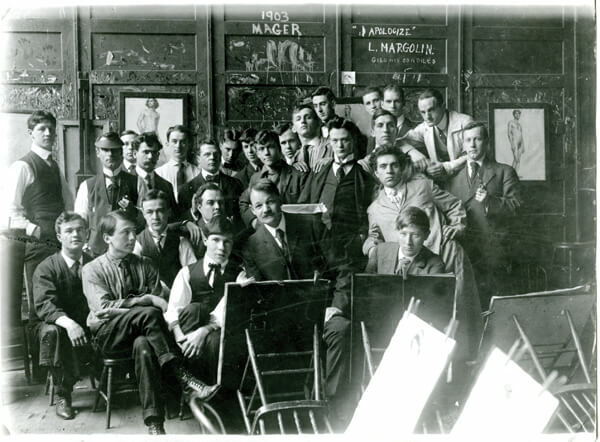 Students in the class of renowned sculptor Augustus Saint-Gaudens (second from right) circa 1890. The Art Students League was founded in 1875 by a group of artists – almost all of whom were students at the National Academy of Design in New York City and many of whom were women. The artists declared their intention to found a new school by pinning a notice on the bulletin board of the Academy inviting students and instructors to attend a meeting. This occurred when it was rumored that the National Academy, due to financial difficulties, would cancel all classes temporarily, forcing students to forgo drawing from life for a significant period of time. Also at that time, in the post-Civil War era, New York City was rapidly becoming the artistic capital of the nation. However, many young artists, influenced by modern European developments, felt that the Academy’s instruction was too conservative and unsympathetic to their new ideas about art. The League opened its school on the top floor of a building at the corner of Fifth Avenue and 16th Street. Classes were conducted in one small half-room. Lemuel E. Wilmarth, who taught at the National Academy of Design, was elected the first president of The Art Students League and became its first instructor. More students and artists joined, and by the end of the first season, the League was renting the entire floor. Courses were funded by membership fees alone. 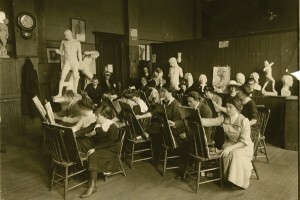 This was a unique policy that ensured the League’s ability to function as the only independent art school in the country, and the only one in which the life class, a crucial element, was available every weekday. The League began and continues to be a collection of studios, each autonomous and directed by the creative authority and counsel of the individual instructor without interference from the administration – a tradition that ensures that students are able to choose among a wide range of modes of expression. This framework, based on the nineteenth-century French atelier system, enabled a pluralistic and inclusive education – one that cultivated both the technical and intellectual components essential to developing the skills of visual artists. In 1878, League members voted to incorporate and to obtain a charter from the State of New York. With incorporation came a constitution and by-laws establishing a Board of Control, consisting of twelve officers, of which three must be students enrolled in the school. This revolutionary approach to running an art education institution, which remains in place today, assured students a central part in the future of the League and granted them power in making decisions that would affect their own development as artists. Soon after the League was formed, young artists returning from Europe began to be engaged as teachers. Hence, from the start, the League consciously associated itself with a “modern” point of view that had great appeal among artists. The League prospered and moved on several occasions to accommodate rapid growth. Other growing art associations in New York united with the League to form the American Fine Arts Society, an independent group. Together with these and other influential arts organizations, the Art Students League planned to build a new landmark facility. A site was selected on 57th Street, between Broadway and Seventh Avenue and Henry J. Hardenbergh, known for his designs for the Plaza Hotel, was hired as the architect. The new building was completed in 1892, and became the League’s permanent headquarters. An exhibition gallery was later added to the building with funds provided by George W. Vanderbilt. This facility, the main campus of the League, was designated a New York City landmark in 1968 and has been listed on the National Register of Historic Places since 1980. Early instructors included William Merritt Chase, J. Alden Weir, Walter Shirlaw, Frederick Dielman, John H. Twachtman, Kenyon Cox, Augustus Saint-Gaudens, Daniel Chester French, Thomas Eakins, Childe Hassam, Frank Duveneck, Thomas W. Dewing and Arthur Wesley Dow. Since those early days, scores of other well-known artists have been instructors or lecturers: Frank Vincent DuMond, George Bridgman and Kenneth Hayes Miller among them. Their students became the well-known professionals of another generation and their legacy continues into the twenty-first century. Many famous artists who have shaped the vocabulary of art worldwide have been instructors, lecturers and students at the League. They include, among many others, George Bellows, Thomas Hart Benton, Alexander Calder, Helen Frankenthaler, Georgia O’Keeffe, Barnett Newman, Norman Rockwell, Winslow Homer, Man Ray, Jackson Pollock, Lee Krasner, Robert Rauschenberg, James Rosenquist, Louise Nevelson, Reginald Marsh, Romare Bearden, Red Grooms, Donald Judd, Roy Lichtenstein, Mark Rothko, Ben Shahn and Cy Twombly. The Art Students League established a Vytlacil Campus that was funded by the family of the late artist and League instructor Vaclav Vytlacil. Located in historic Sparkill, New York, The League Residency at Vyt ran from 2007 until 2016, attracting artist from all around the world for four- or eight-week residencies. Seeds of the League employs League artists to teach underserved youth in NYC Parks recreation centers and provides scholarships for youth study at the League. The Model to Monument public art program trains seven sculptors each year in the public art process and installs their works in NYC Parks. Exhibition Outreach places the work of League students in public spaces throughout the city. Students have sold more than $100,000 of work through the program. As the landscape of art education continues to evolve at an unprecedented pace, the League is in an enviable position. Its unique legacy of artistic training and strong financial position make it possible for the League to maintain and build on its heritage — including its commitment to affordable tuition — and meet the needs of a new generation of artists. Today, the League remains an institution run by artists in support of artists. There have never been any degrees or diplomas or set curriculum. Students come for a hands-on studio education accessible to anyone who truly aspires to develop as an artist — whether they seek to pursue a profession in the fine arts or are just beginning their artistic journey.